A New Wave of Mugs..
..all branded with your establishment's branding and logo. Our Keramikos New Wave Mugs look the part and have this fantastic and completely unique wave style handle. 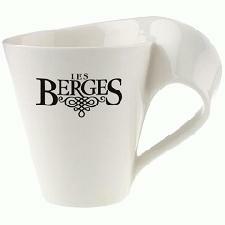 It's ideally a mug you use to really push the limits when it comes to brand-name retention. If your goal is to ingrain your branding in your customers' minds then you need to approach with a different and bold product which looks and plays the part. It's a different world out there and it's tough so get every bit of attention you can get. It doesn't matter whether you're a restaurant, cafe or a full-on corporation. This product works the same - does a fabulous job and won't let you down. Prepare to receive a fantastic ROI and some good brand-name retention that will never be forgotten.